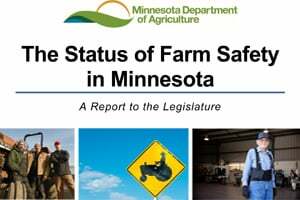 In February, the Minnesota Department of Agriculture (MDA) presented a report, The Status of Farm Safety in Minnesota, to the MN Legislature. The MDA prepared the report with input from the Farm Safety Working Group (FSWG), an informal collaboration between state agencies, higher education institutions, agricultural membership organizations, farm safety advocates, private sector companies and labor and safety organizations focused on improving safety in agriculture. UMASH has been an active member of the FSWG since it was formed in 2015 to provide a forum to discuss safety issues in agriculture, connect groups and organizations who are working on farm safety, and organize collective effort to improve farm safety.